His name has become legendary. His deeds, infamous. Merely mentioning the name ‘Dracula’ conjures images of black bats, blood dripping fangs, eerie castles, and billowing capes. 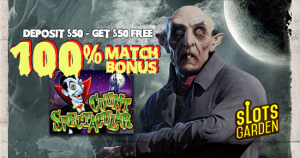 Step into Count Spectacular’s castle today for something really thrilling…a 100% Match Bonus! When you deposit $50, you’ll get an additional $50 on the house. Now that’s something you can really sink your teeth into. Visit www.slotsgarden.com right now!